When you are getting ready for a big move and you are going at it yourself, then a smart first step for you to take will be to secure a moving truck from a company such as Budget. 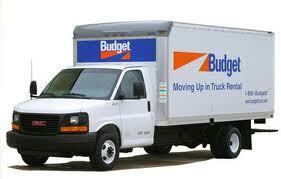 Budget is one of the top names in the moving industry and when it comes to moving trucks, they offer a wide selection. • Cargo Van: Suitable for moving one to two rooms. • Ten Foot Moving Van: Suitable for moving one to two rooms. • 16 Foot Moving Van: Suitable for moving three to four rooms. • 24 Foot Moving Van: Suitable for moving five to eight rooms. All of the Budget moving trucks are suitable for local moves as well as ‘one way’ moves, which is where you rent from one Budget rental place and return it to another, except for the cargo van. Budget only rents out the cargo van for those who are doing a local move. For each Budget moving truck, you are charged a flat fee, which will vary on whether your move is local or one way, and a mileage fee as well. Again, these fees can vary according to the specific location that you use, but for the most part they are standard. You can also get discounts and other incentives when you use the Budget website to book your Budget moving truck reservation. There are two things in particular that you will want to be sure and pay attention to before you return your Budget moving truck. The first is to make sure that you are bringing it back in with the same amount of gasoline that it left with. While you can return it on a lower amount, Budget will then charge you far more than the regular amount of gasoline in order to get the gas level back to where it was. The second thing to pay attention to is how clean the back of the truck is. If Budget considers it ‘dirty’ then your credit card that you use to secure the Budget moving truck may get hit with a ‘cleaning fee.’ So, you should be sure that you thoroughly sweep out the back of the Budget moving truck you rent and ensure it is debris free. If at any time you run into any question that you need answered, you can always call Budget on their toll free number. There they have a dedicated staff just waiting to answer any inquiry that you may have. Moving your things can be a stressful event, but securing a moving truck doesn’t have to be. Working with a moving truck company, such as Budget moving truck, can help you ensure an easier move with a company that you know and trust. Tip: Use a Budget truck promo code to save 10% off Budget truck rentals. Used a budget truck to move from seattle to denver last year and it was fine. Nothing special but at least it didnt break down and it really was cheaper than uhaul (finally gave up on them after 2 breakdowns). Worst truck ever! Stupid thing broke down but I was still charged for the days it took them to finally come get it. Then they had the nerve to charge my bank account more than $5000! Me and my kids were homeless with no food! Do NOT use Budget for your moving truck. This company will screw you over and over again! Save yourself and use someone else!